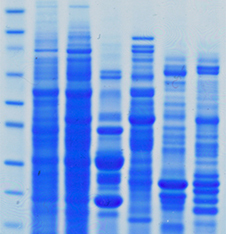 Coomassie blue stained 1D-PAGE of protein fractions. My laboratory is involved with various protein-based research projects. Silver stained large format 2D-PAGE protein extract display. We use a variety of protein purification and analysis methods, including 1D- and 2D-electrophoresis (both mini-gel and large format), OFFGEL isoelectric focussing, western blotting, FPLC and HPLC of proteins, peptides and pigments, use of mass spectrometry workflows for proteomic analysis, and various biophysical analysis methods in collaboration with other researchers. Protease assays, bioactive peptide in vitro bioassays and more specialised cell-based assays. 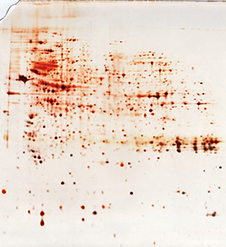 Ion exchange chromatogram of fractionated proteins. Bekhit, A. E., Hopkins, D. L., Farouk, M. M., & Carne, A. (2013). Interventions to improve the tenderness of fresh meat: A future prospect for camel meat research. In I. T. Kadim, O. Mahgoub, B. Faye & M. Farouk (Eds. ), Camel meat and meat products. (pp. 153-185). Oxford, UK: CABI. Pilbrow, J., Garama, D., & Carne, A. (2012). Carotenoid-binding proteins: Accessories to carotenoid function. Acta Biochimica Polonica, 59(1), 163-165. Garama, D., Bremer, P., & Carne, A. (2012). Extraction and analysis of carotenoids from the New Zealand sea urchin Evechinus chloroticus gonads. Acta Biochimica Polonica, 59(1), 83-85. Swe, P. M., Heng, N. C. K., Ting, Y.-T., Baird, H. J., Carne, A., Tauch, A., Tagg, J. R., & Jack, R. W. (2007). ef1097 and ypkK encode enterococcin V583 and corynicin JK, members of a new family of antimicrobial proteins (bacteriocins) with modular structure from Gram-positive bacteria. Microbiology, 153, 3218-3227. Sadighi, M., Reichman, N., Wilson, K., Carne, A., & Thompson, M. P. (2006). 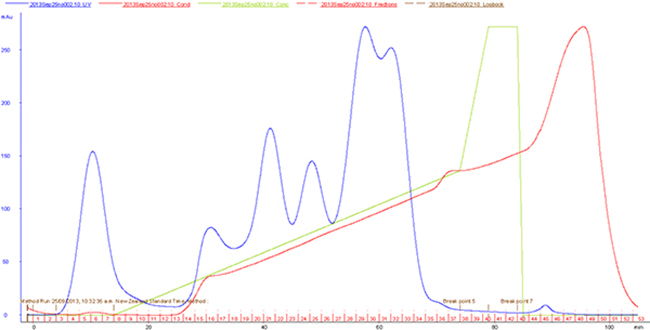 A nitrogen balance experiment using simulated urine samples. Biochemistry & Molecular Biology Education, 34(4), 289-293. Balakrishnan, M., Simmonds, R. S., Carne, A., & Tagg, J. R. (2000). Streptococcus mutans strain N produces a novel low molecular mass non-lantibiotic bacteriocin. FEMS Letters, 183, 165-169. Molteno, A. C. B., Dempster, A. G., & Carne, A. (1999). Molteno implants: the principles of bleb management. Australian & New Zealand Journal of Ophthalmology, 27, 350-353. Brown, M. A., Carne, A., & Chambers, G. K. (1997). Purification, partial characterization and peptide sequences of vitellogenin from a reptile, the tuatara (Sphenodon punctatus). Comparative Biochemistry & Physiology Part B, 117(2), 159-168. Brown, M. A., Carne, A., & Chambers, G. K. (1996). Indentification and partial characterisation of a2-macroglobulin from the Tuatara (Sphenodon punctatus). Comparative Biochemistry & Physiology Part B, 113, 731-736. Monk, P. D., Carne, A., Liu, S.-H., Ford, J. W., Keen, J. N., & Findlay, J. B. C. (1996). Isolation, cloning and characterisation of a trp homologue from squid (Loligo forbesi) photoreceptor membranes. Journal of Neurochemistry, 67(6), 2227-2235. Carne, A., Mc Gregor, R. A., Bhatia, J., Sivaprasadarao, A., Keen, J. N., Davies, A. F., & Findlay, J. B. C. (1995). A ¯-subclass phosphatidylinositol-specific phospholipase C from squid (Loligo forbesi) photoreceptors exhibiting a truncated C-terminus. FEBS Letters, 372, 243-248.